Whenever you receive a sales related email from your prospects/leads, you typically add a deal *manually* in CRM. But adding a deal manually each time can be tedious and time-consuming. Sales automation is designed to solve this problem. All you need to do is set up a sales automation rule and TeamWave CRM will create Deals and Contacts automatically! Email addresses specified in a 'Rule' cannot belong to multiple 'Rules'. Email addresses specified in a Rule shouldn't be associated with users/employees of your TeamWave organization. 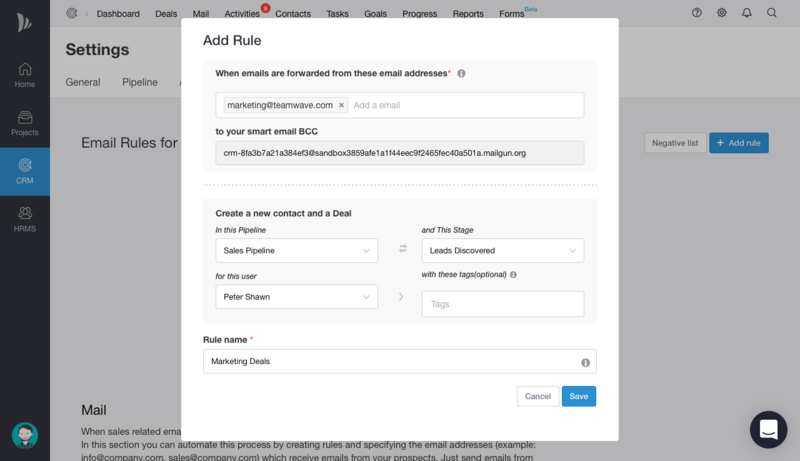 You need to forward emails to you CRM Smart Email BCC only from email addresses specified in Sales Automation Rules. Remember emails forwarded from other email addresses will not be processed for Deal and Contact creation. For every new email address captured by TeamWave, a new contact person and a corresponding deal will be created. Finally, both of them will be linked. For subsequent emails forwarded for existing contact already attached to a deal, the new email will only be logged to the existing deal and contact person (new deal won't be created). New contacts won't be if the email address belongs to your TeamWave account employees. For email automation to work correctly, you have to ensure that your sales email address (ex: sales@company.com) is forwarding all incoming emails to TeamWave's Smart Email address. Currently we support Gmail, G Suite & Outlook.